Gary Leckey is a serious foodie. He just never stops talking about it. He knows street food is a massive trend and he loves to create fabulous food from the best local, fresh ingredients. He puts his twist on them, so expect delights like REAL corned beef sandwiches called the “Rex” served with their own Russian dressing, sauerkraut and on malted bloomer bread. 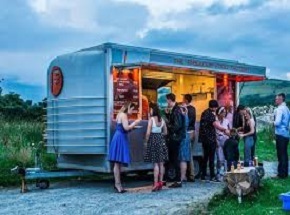 Every mobile catering set-up has a burger, but theirs are home-made using local Dexter beef and their bread comes from a local baker. There are always very fine vegetarian and children’s options. The filter coffee and speciality teas are Fairtrade and the packaging is 100 % compostable. With allfood not used going to homeless shelters, the sustainability and green boxes are firmly ticked also! They do everything from rock concerts to weddings, country fairs and canapé evenings far and wide. They’re completely self-sufficient so have van, will travel and trade literally anywhere… from city centre car parks to walled gardens to fields deep in the Mourne Mountains.